What Exactly is a Microneedle Roller? In order to understand what a microneedle roller is (and how it works), you need to learn the basics of microneedling. Microneedling is a cosmetic procedure used by cosmetic dermatologists and plastic surgeons to help provide dramatic changes to the skin. The idea behind this procedure is to take advantage of the skins innate ability to heal by providing targeted and specific damage to the upper layers of the skin. This is done by poking and prodding the epidermal layer of your skin with tiny little needles! A microneedle roller is a barbaric looking device used to do just that. These rollers contain hundreds of needles on a tube-like device that can be tracked over the skin to literally poke holes into your skin. It sounds barbaric and crazy but it actually works. Microneedling actually provides MANY different scientifically proven results to your skin. These results tend to come from the damage to the skin (discussed more below). The first, and perhaps one of the most important, benefit is that microneedle rollers cause an increase in collagen growth. You might not know about collagen so let me fill you in. This protein is responsible for keeping your skin looking young, tight and wrinkle-free. Collagen is the protein that provides strength to your skin. And collagen is the thing that DECREASES with age, with sun exposure and with certain bad habits (like poor diet and smoking). So whenever we can increase collagen, with any procedure, it is something we want to take seriously. Increasing collagen WILL help your skin look younger and more beautiful. The more collagen you can stimulate the better. One of the BEST ways to produce collagen is to stimulate your skin to naturally produce it by itself. This is opposed to taking supplements or serums to try and improve the production in that way. Microneedling has been proven to increase collagen and help reduce aging. Another benefit of microneedling is that your skin will LOOK and FEEL better. This will be seen as an overall improvement in the quality of your skin. Skin quality and texture tend to fade over time with the aging process. It's not uncommon for pimples, sun damage and other normal processes to cause negative changes to how your skin looks. I'm not talking about wrinkles here, I'm talking about the texture or smoothness of your skin. The healing process initiated by microneedling causes a robust reaction in the skin which releases growth factors which can rejuvenate the skin. Another huge benefit (for some people) is that microneedling can actually help to clear up acne pockmarking and scars. This is also true for OTHER causes of scarring on the face as well. The tiny little needles of the microneedle roller "poke" through the scar tissue and release the contracture beneath the skin. If you feel scar tissue you will notice that it is bump and irregular and this is how scar tissue tends to form. This formation can cause "pock marks" on the skin as the scar tissue beneath the skin pulls down the upper layers of the skin. Poking holes into the scar tissue can release the scarring beneath the skin and release the tension. This results in an improvement of how scars look, especially on the face. Up until now, there are only a few other ways to actually reduce scar tissue (such as lasers). Microneedling (especially medical microneedling) is a scientifically documented and proven way to improve and reduce the appearance of acne scars on the face. Treating scar tissue can take multiple sessions, however, so don't expect immediate results if you use a microneedle roller once or twice! Wouldn't it be nice if you could even out your complexion and reduce the hues of blue and red in your skin? These color changes are referred to as pigmentation and it is one of the most important aspects of making your skin look older. Pigmentation associated with aging is actually more important than wrinkling (believe it or not). Because you can cut back your wrinkles but this pigment will still make your skin look "old". Microneedling can help even out skin tone and complexion, probably through activation of growth factors and the healing process. This makes microneedle rolling one of the best anti-aging procedures out there. How it Works & Is it Too Good to be True? The answer is no, microneedling is NOT too good to be true. It may sound that way at first, but once we unpack how it works it will make more sense. You also have to realize that there is a big difference in results when we talk about microneedling at home with a roller vs medical microneedling done at the office. The idea is that by poking holes into the superficial layer of your skin you are causing a large amount of superficial trauma to the skin. This trauma looks worse underneath the skin than it does on the top of the skin. You can imagine this because the needles will come it at different lengths and angles, but they are only going through tiny holes on the surface. These holes damage the underlying skin cells (which don't have much blood supply) and without going deep enough to hit the dermis. This damage triggers a chain reaction which causes your body to release powerful growth hormones and healing factors to help repair the damage. In addition, both collagen and elastin are stimulating in an attempt to improve structural integrity to the skin. These changes result in the skin healing completely within just a few days to a week, but the healing process causes the skin to tighten and even out both in terms of complexion and pigmentation. You can imagine this process by comparing it to muscle growth in your body. You work out to break down and tear your muscles slightly only to have them recover and grow in the process. We are basically doing the same thing, but with microneedling, it's happening to the collagen and elastin in your skin. 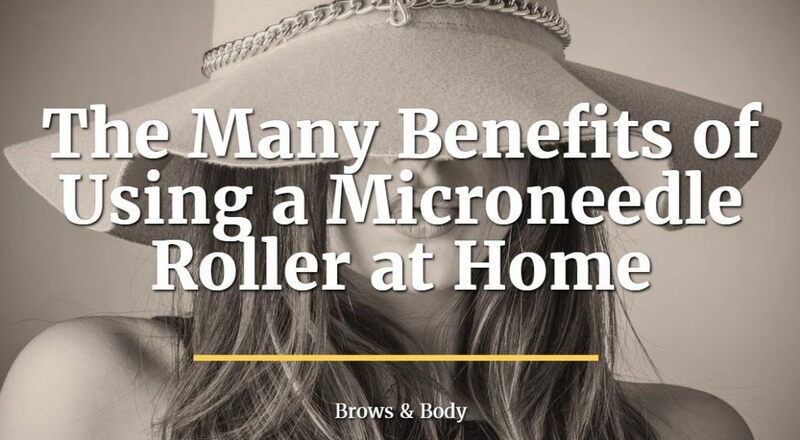 Remember when I said there was a difference between medical microneedling and at home microneedle rolling? It's time to learn more about that difference. Microneedling in an office is usually done with the use of a mechanical pen-like object which vibrates at a high rate. This pen is basically a motorized way to help poke more holes in your skin. A microneedling pen will have 10+ needles of the tip which vibrates at a very high rate. As the pen is vibrating it is dragged across your skin to deliver thousands of holes into your epidermis. Microneedling with a microneedle pen allows more penetration, deeper penetration, and therefore better results when compared to a microneedle roller. The microneedle roller is basically a cheaper way to allow yourself to get the microneedle experience (and some of the benefits) without paying hundreds of dollars for the microneedle procedure. Microneedle rollers do NOT penetrate deep into the skin and they do NOT provide the same results when compared to medical microneedling. But does that mean you shouldn't do it? Microneedle rollers can be used as a cheaper alternative, especially for those on a budget, to help at least get some results. In addition, it can be used as a trial or stepping stone to determine if you like the idea of getting the real deal. You can start out with microneedle rolling and then jump to medical microneedling when/if you are ready. #1. All rollers differ in the number of needles that they have (in general the more they have the better your results will be). #2. Rollers may differ in the length of the needle (which will determine how far into your skin they go). #3. Rollers may be made out of plastic material which may not last very long (meaning you will have to constantly re-purchase microneedle rollers over time). With these in mind, I recommend using a dermaroller such as this one. This dermaroller will easily get you started and its high enough quality for several uses. For even better results you can also combine dermarolling with a vitamin C serum. When I use a microneedling pen on my clients I always finish off the procedure with a high-quality Vitamin C serum which helps to improve the healing process, tighten the skin and enhance your results. To start with you probably don't want to roll over your skin more than 3x per week (you should probably start with just 1-2 sessions per week). You can do this at night after you've cleansed your skin. Finish off the procedure with Vitamin C serum which you can leave on your face overnight. Microneedling is a great procedure which can be used to improve the overall quality and texture of your skin. The main benefit from this procedure seems to stem from stimulation of collagen, elastin and growth hormones from the skin. You can obtain these benefits by using a microneedle pen or by using a microneedle roller. Have you used a microneedle roller before? Have you had medical microneedling done before?